Whether you’re graduating from nursing school, rejoining the workforce after time away, or looking for a better career fit, searching for healthcare jobs can be a frustrating and sometimes overwhelming process. This guide will cover every aspect of your search, from where to find the best healthcare jobs, how to follow up after submitting an application, and what to say in a cover letter. Whether you’re looking for nursing jobs, doctor jobs, or healthcare IT jobs, you’ll be able to navigate the process with confidence. Sometimes, actually beginning your search for a healthcare job can be as difficult as submitting an application. How do you sift through job sites, decipher which qualifications you need, and find the right fit? Perhaps the most obvious place to start your job search is on a job board. Sites like Glassdoor, Ziprecruiter, and Relode are good places to start, since all these sites have hundreds of healthcare jobs in a variety of specialties. While these are great places to start, it’s important to make sure that the jobs you find are actually the jobs you’re interested in submitting an application for. Make sure to take advantage of filtering when you’re looking for a specific position. Just searching for “nursing jobs” or “doctor jobs” may not be the most helpful. Instead, be as specific as you can, and make sure to include your speciality, like “hospice nurse jobs.” On most platforms you can then filter by position type, location, category, and more to make sure you’re only seeing the healthcare jobs you want. When you find a potential position, make sure to read the description carefully, and double check the licenses and experience needed. Make sure your profile is up to date. This means spell checking, confirming your past positions, and writing a great summary. Add your outside projects. If you have a blog, vlog, or portfolio, LinkedIn is a perfect place to showcase those. At the bottom of your profile section, there’s an option to link to any projects. Don’t forget to update the skills section with your current skills. You can reach out to your connections to have them endorse your skills as well. For most medical jobs, you’ve probably had a number of relevant skills that you can list. Write a killer summary. Although it is usually only a few sentences, writing a great LinkedIn summary can help to better establish your professional identity, which will in turn lead to more interested employers. Keep your target audience in mind. If you’re looking for pediatric nurse jobs, mention specific experiences that made you successful. Employers will respond better to specifics. You can also consider what a hiring manager might be looking for, and work those skills into your summary. Write in first person. This is not a bio, this is a space for you to write about yourself in a unique and compelling way. The more relatable and authentic you are, the more an employer will be interested. This doesn’t necessarily mean that you should use completely casual language, but think about sharing your story, as opposed to “selling” your skills. Invite your readers to connect. At the end of your summary, make it easy for someone to get in touch with you by including your email, or a call to action for the reader to message you on LinkedIn. As a healthcare professional, there are also a number of specific healthcare job boards that may cater to your specialty. For example, if you’re looking for doctor jobs, sites like practicematch, physicianjobboard, and mdjobsite are great places to start. These job sites range from permanent positions to locum tenens physician assignments. You can also check the Relode job board, and search jobs based on location, keyword, category, and more. If you’re looking for a more personal approach, reaching out to your network can also be a great place to find positions (and may be less overwhelming than trying to sort through job listings). Look for industry-specific events, as well as other clubs and organizations that might help connect you to job openings. For example, are you an OR nurse? Joining your local chapter of AORN might be a good start. If you’re looking for pediatric nurse jobs, NAPNAP has some resources that may help. Looking up conferences and events to attend may help you meet people who are hiring, and may also help you make connections that might be helpful in the future. Get in the mindset. Networking or meeting people you don’t know can be nerve-wracking. If you’re nervous, changing your mindset can make all the difference. Focus on the fact that you’ll be meeting exciting people and that you may learn something. It will help you better connect with people as well. Repeat someone’s name when you’re first introduced to help you remember it. Instead of asking “where do you work?” try another opener such as “what brings you to this event?” or “what’s your story?” Asking open-ended questions can help to better spark a conversation. Listen to what the person is saying. When networking, it can be easy to tune someone out or focus on what you’re going to say next. Concentrate on the other person and ask relevant questions. Clarify follow up. It can be helpful after a great conversation ask how the person would like to be followed up with. Some people are huge LinkedIn fans, while others only check their inboxes. Knowing how a new connection likes to be contacted can help you continue to make a great impression. After you’ve found a position that might be a good fit, what’s next? While it’s true that any day is a good day to find a new job, there are certain days and times that might be better than others. According to a study that examined 1,600 job applications from Talentworks, candidates who submitted their resumes after 4 p.m. had a 5% or less likelihood of being called for an interview. That same study also showed that candidates who submitted their applications between 6 a.m. and 10 a.m. (in the employers time zone) were much more likely to get an interview. Time of day isn’t the only important consideration when applying for a job — the day of the week matters too. Applying on a Monday or Tuesday is way better than sending your application on a Saturday. Often, a hiring manager’s inbox will become flooded with applications, so you want to make sure that yours appears at the top, which means sending it earlier in the week. In fact, in a study from Bright.com (acquired by LinkedIn), Tuesdays were not only a good day to apply, but also was the most popular, with 37% of job seekers applying for jobs on Tuesday. By contrast, Saturday was the least popular, with only 14% of job seekers finding success. Luckily, only 5% of candidates apply for a job on a Saturday. Perhaps unsurprisingly, Monday remains the most successful day to apply for a job, with 30% of candidates landing the position when they submitted their applications. It may seem obvious, but the earlier you apply to a job after it’s been posted may also make a difference. New healthcare jobs are usually posted earlier in the week, and applying for a position in the first 3-4 days after it’s been posted is much more likely to land you an interview than if you apply a few weeks after the position has been posted. Additionally, looking for a new job in November, February, March, May, June, and October may yield better results than applying in December or August. So you’ve figured out the when, but what about the how? Although this can be time consuming, organizing your resume for the specific position can be the element that makes your application stand out. Most hiring managers spend an average of 5-15 seconds on every resume, so you need to make sure you have the relevant information highlighted in an easy-to-read format. 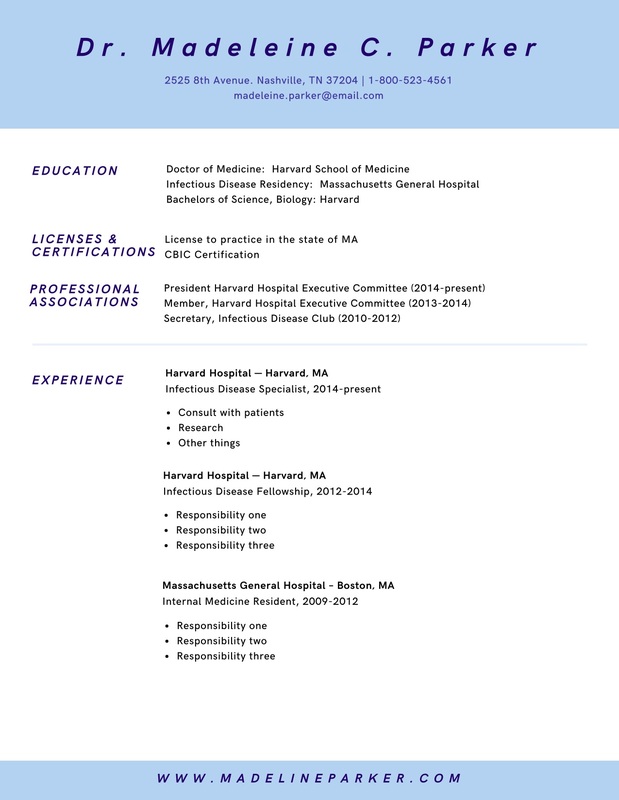 While there are multiple ways to organize resumes, when you’re applying to a healthcare position, you’ll want to highlight your credentials and certifications, and also your experience within your specific field. Use bullet points to make it easy for hiring managers and talent advisors to read important information. List accomplishments instead of duties. Facilities will want to know what you will bring to the team (We get not wanting to sound like you’re bragging, so if it helps, focus on explaining your duties in a way that highlights how you can help the employer). Think about saving your resume as a PDF. This makes it easier for employers to view and print it. Clearly organize your credentials. If you’re a nurse or doctor, the hiring manager is going to want to quickly see where you are licensed and what other certifications you have. Make them easy to find. S P E L L C H E C K. Even simple spelling errors can communicate unprofessionalism, so make sure you double check that your spelling and formatting is correct before your send it (If you feel like you’ve been looking at it too long, have a friend read it over or try reading it out loud to catch mistakes). If your design skills are rusty, there are a number of sites that can help you build an awesome, professional looking resume (we love LinkedIn’s resume tool and ineedaresu.me). Remember, most hiring managers spend less than a minute per resume. You want to create a document that is easily scannable, so that anyone can find the most important and relevant information as easily as possible. Often for healthcare professionals, a cover letter can inspire feelings of dread. While not all positions require a cover letter, it’s helpful to know what to include if you ever need one. However, creating a strong, compelling cover letter is achievable with a little planning. The cover letter is basically designed to show a potential employer that instead of wanting a general job, you want this particular job. It’s a chance to create a compelling case for why you’d be a great fit for both the role itself, and the facility in general. Even if you’re not an incredibly strong writer, you can still craft a smart and compelling cover letter to grab a potential employer’s attention. Make an individual cover letter for each position you apply to. Although it’s more time consuming than having one generic cover letter, it may open doors that your resume cannot. Don’t just summarize your resume. Your cover letter is a chance to explain about how your experiences make you a good fit for a role — this also means addressing any issues in your qualifications. Are you overqualified? Explain why you’re still interested in the role. Missing qualifications? Explain how your other experiences make you a good fit regardless. Don’t exaggerate. It should go without saying, but your cover letter should be truthful. This means staying away from phrases like “I’m the most qualified candidate you’ll find,” or “You’ll never find a better fit than me.” Although you want to demonstrate confidence, you also want to give the hiring manager the most honest assessment of yourself and don’t want to come across as “salesy” or not genuine. Proofread. After you’re finished with the letter, give it to a friend to read, or read it out loud. This will help you catch any mistakes you may have made the first time around. Your opening line should be specifically targeted to address an issue the facility faces. If you’re unsure which problem they need addressed, read through the job description carefully. The kinds of daily responsibilities may give you a clue about what’s needed. In this example, you not only mention your background (establishing credibility), but you also establish camaraderie with the hiring manager who has likely been experiencing this issue. Frame the problem within the larger conversation. This means not only (gently) reminding the employer how painful the issue is, and addressing the kind of person they might need. The key in this section to be specific. Here, you’re speaking to a specific problem that would resonate at a busy facility. This is where you can point to how you are the solution to these issues by concentrating on how your experiences intersect with what the employer needs. The key here again is specificity. Don’t just rely on buzzwords like “I am a motivated self-starter,” instead, point to individual experiences where you illustrated those qualities. In this example, you point to a few specific instances that speak to the pain point mentioned in the previous sentence, making sure to highlight your experiences. You can add a few more sentences to this section as well that address different areas of your background. Was there a time you successfully dealt with a difficult patient? Showcasing those examples lets the employer know that you’ll be an asset if a similar situation arises at their facility. Wrap up your letter with a polite closing sentence. Don’t overthink this part, just add a short sentence. While you can customize your letter any way you’d like, make sure it’s not longer than about half a page to a page. Often, a hiring manager will only spend a short amount of time on a cover letter so every word counts! Good news! Your amazing cover letter and beautifully designed resume caught the hiring manager’s attention, and now it’s time for the interview. How should you prepare? Whether you are interviewing over the phone or in person, there are a couple interview tips to keep in mind. First, do your research — when you interview, you should have at least some kind of understanding about the facility, such as what they value and other basic facts. You can ask more specific questions during your interview, but you should have a little knowledge beforehand. This will help you to better tailor your responses during the actual interview. Second, know your why — it’s important to be able to articulate not just why you want a new job, but why you want a job with the particular company. What stood out to you when you were job searching? It may seem like common knowledge, but many interviewees forget that a company wants to know you want to work for them as much as you want to be hired. Third, prepare your responses — Make sure you brush up on interview questions you’re likely to be asked. Knowing in advance what you might be asked can help you sound more confident, and you’ll be less nervous when you have a response prepared. Interviews are typically segmented by a phone interview and an in-person interview. Here’s how to master both. In most hiring processes, the phone interview is the first step in landing a great job is the phone interview. Companies often use phone interviews to screen potential employees before bringing them in for an in-person interview. This presents a new set of challenges as it can be harder to come across as personable and professional over the phone. Additionally, because you won’t be able to see your interviewer in person to gauge his or her expressions, the way to ace a phone interview is a little different than an in-person one. Here are our top tips for a great phone interview. Take it seriously A phone interview can often be just as important as an in-person. This means you should treat it as important. Make sure to prepare in advance by researching the company and preparing. One tip that may also help is to change out of your casual clothes and into something that you might wear to an actual interview. This could help get you in the right mindset for the interview. Create the right environment If you can, find a quiet area for your interview in a place with minimal distractions. It can also be helpful to get paper and a pen for taking notes, and you can also jot down your questions during an interview (and you should have questions!). You can also keep a copy of your resume on hand since the interviewer will likely be referring to it during the interview. Don’t forget to follow up After your interview, it’s polite to send a quick thank you to the interviewer for taking time out of his or her day. This doesn’t need to be an elaborate hand-delivered card; a short email works well. After a successful phone interview, you will most likely be asked to participate in an in-person interview. This is your chance not only to impress the employer, but also to evaluate whether the job will be a good fit. Dress the part. No, this doesn’t mean wearing your scrubs. Even if the job you’re applying for will have casual dress, you’ll still want to look nice for the interview. This demonstrates that you’re willing to be professional in the workplace. How will success be measured in this position? This question lets you know not only what it takes to do well in a position, but also how you’ll be evaluated. It can also give you insight into how your future manager will measure your progress. What are some challenges you expect the person in this position to face? In addition to identifying what the most common situations in a position will be, it also lets you know if people have had issues with patient families, departmental politics, or other situations. This is a good opportunity for you to also demonstrate how you’ve coped with similar situations in the past. Thinking back to people who’ve held this position before, what separated the ones who did a good job versus the one who did a great job? This question is one of the best because it helps you identify exactly what the interviewer is looking for in a candidate. The hope of any interview is that the company will find a person who isn’t just good at the job — they want someone great. This question also lets your interviewer know that you’re aiming to be excellent at the position, not just ordinary. What is the company culture like/what does a typical day look like/etc. Often we focus so much on being liked during an interview, that we avoid asking the question we really want answered, which may then translate into taking a job that’s not the right fit. Spend some time before your interview thinking about what you really want to know, and don’t be afraid to ask. What are the next steps? Getting a sense of the interviewer’s timeline gives you a good timeline for when you can expect to hear if you've landed the job. Make sure to take the answer with a grain of salt though, as other issues may arise that would prevent an interviewer from getting back to you. Remember, the interview exists not just to evaluate whether an employer likes you, but also to determine whether the facility would be a good fit for you. So pay attention to the answers you’re given — they’ll help you figure out if the job will be something you’ll want to stay in long term. After you actually submit your application, it can be agonizing to wait to hear back from the employer. While it might be tempting to send 10 million emails reminding the hiring manager that you’ve applied, restraint is key when checking on your application. While you should definitely send a thank you note after your interview, following up is not always necessary. For the most part, if a hiring manager or company feels you’re a good fit for a position, they’ll contact you. Ideally, at the end of your interview, you can ask the person conducting the interview what their hiring timeline looks like. However, hiring often takes longer than employers expect it to, so add a week or two to the date the interviewer gives you and set that in your mind as the decision date. In a best-case scenario, you should try to forget about your application until a few weeks have passed. If you’re determined to follow up about a position, take that extended timeline, add a week, and mark that as your follow up date. Hopefully, the employer should get back to you (if they’re courteous). Otherwise, assume you didn’t get the job and move forward with your search. Thinking about other applications can keep your mind off the positions you never heard from, and will also keep you from the temptation of reaching out too many times. In your search for healthcare jobs, you may find it easier to work with dedicated healthcare recruiters. Depending on who you choose to work with, recruiters can be invaluable when it comes to finding positions quickly and connecting you to the people making hiring decisions. This is especially true in the healthcare industry, where the amount of doctor jobs, nursing jobs, and healthcare IT jobs can be overwhelming. Although recruiters are an excellent resource, some people may feel wary about working with them, or unsure if a recruiter can actually help more in a job search. Below we take a look at some of the myths surrounding working with healthcare recruiters. Working with a recruiter is only for the desperate. Not quite. Recruiters can be incredibly helpful for anyone considering looking for a new job. Because they work directly with clients, working with a recruiter means that your application is more likely to be seen, and when you have a good relationship with your recruiter, they can act as your advocate for the facility. Recruiters just want to place you in a job. While that may be the case with some recruiters, for the most part, they are genuinely invested in connectting you with a job that’s the right fit. For example, at Relode, a win for you is a win for our team, so they’re especially committed to helping you find a great job. I can’t afford a recruiter. Surprisingly, this is a common misconception. However, working with a recruiter should be completely free for a job seeker, since the employers are paying the recruiter to find top talent. At Relode, we take care of paying our agents, so finding great jobs are free for healthcare professionals. This doesn’t mean that all recruiters are created equal. If you choose to work with a recruiter, investigate the company carefully to make sure he or she has your best interests at heart. Finding a great healthcare job is attainable if you take the time to make sure you're job searching the right way. We'd love to help you get started with your search! If you need help with the healthcare hiring process, we’re always available to answer any questions you have. Reach out to team@relode.com to get started. You can also read how Michelle and other healthcare professionals have successfully used Relode to grow their careers. You can also browse open positions here.